That’s right, ladies and gents! The results of the Marvel Vs Capcom Contest are in! WE’RE ALL WINNERS!! We sent the tracks lovingly constructed by our beatsmith contestants, Vince Vandal, MC Squared, and IllGill and are proud to present the final results to you. Hopefully you’re already rocking the recently-released Ultimate Marvel Vs. Capcom 3 and you’re pumped for some new combatants. We’re splitting sides of the battle. First up are our Mighty Marvel Marauders: Adam WarRock, Wordburglar, Tribe One, and surprise challenger: Storyville. Look for our Capcom challengers in a future post. 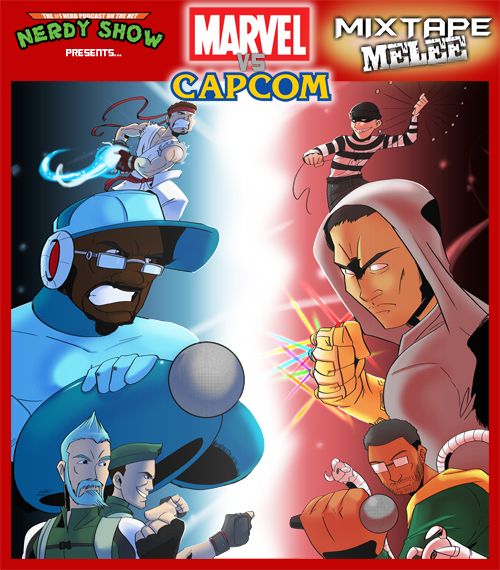 In celebration of Marvel Vs Capcom 3, Nerdy Show presents the Marvel Vs Capcom Mixtape Melee – pitting some of the best in contemporary nerdcore hip-hop in a battle of geekdom where each rapper mush choose a side. All beats were fan-sourced and crafted either exclusively from Marvel or Capcom-related audio.